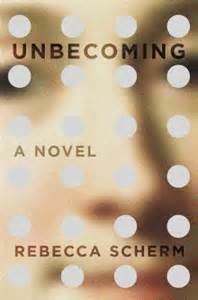 Unbecoming is Rebecca Scherm’s first novel. It is a story about a girl from Tennessee named Grace and her attempts to reinvent herself. Wishing to live a life which she has been denied by birth, Grace tries to ingratiate herself into the family of a young man named Riley whose family with married parents and four boys appears to be the answer to Grace’s dreams of normalcy and the feeling of being wanted. This an interesting tale with unexpected twists and turns, a pathological liar, and several thefts. The story takes place in the U.S. and Europe. I thought it took too long to get to the climax of the story. I do think it has a creative plot and wish the story had grabbed my interest sooner. If you can get through the first three quarters of the book, the ending makes it all worth the wait. This entry was posted in Uncategorized and tagged Books, New York, Paris, Rebecca Scherm, Unbecoming. Bookmark the permalink.